Sunflower seed flour may be produced by milling de-hulled sunflower in a Universal mill with plate attachment. 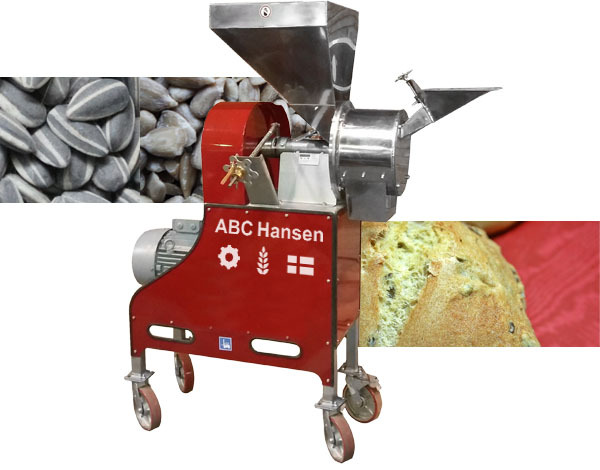 Machines for de-hulling and separating sunflower seeds can also be obtained from ABC Hansen. Often de-hulled and cleaned sunflowers are bought in for processing. Sunflower flour may be processed as a fine or crunchy flour and is for instance used in Germany, when mixed with oats flour to make Sonnenblumenkernbrot (sunflower whole seed bread). Halva, a sweet confection is prepared in many parts of the world such as Asia, North Africa, the Horn of Africa, the Balkans, Central Europe and Eastern Europe, Malta and the Jewish diaspora from either semolina (grain based) which is mostly found in India, but also with nut butters such as sunflower seed butter, tahini (sesame paste) and sugar.